Staying safe during hot summer months is easy, right? Not quite. Drinking lots of water and wearing sunscreen isn’t enough. There’s more. To help, here are some questions and answers about summer safety you need to know in order to keep summer fun. 1. How hot does my car get when it’s left outside? The National Weather Service (NWS) reports that at just 80 degrees outside, the temperature inside your car can soar from 80 degrees to a scorching 123 degrees in just 60 minutes. 2. What is the UV index and why does it matter? The ultraviolet light (UV) index, which ranges from 0 to 20, measures the distance of the sun to the earth’s surface. The UV index is greater in high elevation places like mountains. The higher the index, the closer and more damaging to the skin the sun is, and damage to the skin leads directly to skin cancer. Although the sun is skin cancer’s No. 1 cause, it can also lead to premature aging through fine lines, wrinkles and skin discoloration. The NWS says that wearing protective clothing, a sunscreen with a 15 SPF or higher and staying out of the sun from 10 a.m. to 4 p.m. will offer the maximum protection against the sun’s harmful UV rays to your skin. 3. In addition to harming the skin, UV rays can damage eyesight and cause cataracts. Wear UV protectant sunglasses to protect your eyes from UV rays. 4. Is it OK to leave my child or pet in the car for a few minutes if I leave the windows cracked? No. Leaving a pet or child in the car, even if just for a few minutes, can have devastating results. Although heatstroke-related deaths among children have decreased nearly 50 percent since 2010, according to the NWS, there’s still a long way to go. Only 80 degrees outside the car can become dangerous inside the car. The NWS also reports that close to 40 children die every year from being left in hot cars. You can tell if someone is having a heatstroke if they are experiencing these heat stroke symptoms confusion, headache, dizziness and nausea. They will also have a high body temperature, changes in perspiration, a fast pulse and rapid breathing. Sips of water and a cool environment are the best ways to care for someone in heat stress. 5. 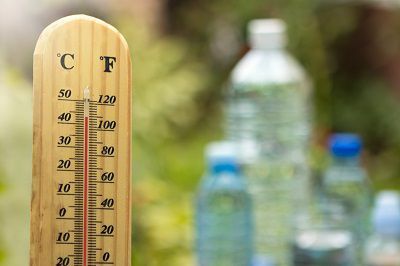 Other than heatstroke, what are other heat-related risks? * Heat Exhaustion – Sweating, cool skin, dizziness, nausea, vomiting and fainting are all signs of heat exhaustion. * Heat Cramps – These are spasms in the stomach or legs, along with lots of sweating. 6. Who is most at risk for high-heat conditions? Children, the elderly, outdoor workers and athletes must take the most care to stay cool in the summer. 7. What other things can I do for myself and my family to stay safe? How do you stay summer safe when having summer fun?